Embracing the disease from a new perspective. In my last six posts, I have focused on all of you knowing that there is nothing wrong with you in your essence, your soul, and how your viewpoint of reality helps determine how great your future will be. Today, our discussion focuses on acceptance of the reality occurring right in front of your eyes, and subsequent posts will assist you in growing that acceptance into gratitude. Seven years ago I wrote a post about acceptance at a level I called my “okay” attitude. It assisted me in learning acceptance and in releasing habitual negative triggers in my emotions. I will begin today with excerpts from that post and we will grow acceptance from there. “Okay” is the word I have come to use to denote acceptance followed by dealing with the issue and working toward a solution. There is a certain emotional detachment that comes with “okay,” but that type of clear-headed emotional detachment is what you need to beat this disease. However, I have to admit that it was Sally who first used the “okay” strategy when we realized I had Parkinson’s. When I first realized I had Parkinson’s and Sally and I discussed it and then cried together, she settled down and said, “Okay, we need to put a plan together and figure out what we are going to do about this.” Looking back, I know this was the most loving thing she could have done because I had to put my “poor me” away and start to work on a solution. As I went through my recovery, I learned that “okay” meant acceptance. Remember, please, that acceptance does not mean acquiescence. “Okay” is a call to action. It identifies an issue and works toward a solution. The other response is emotions. It is fear and worry and anger about the future. It causes paralysis of the spirit, which causes paralysis of the mind, which causes paralysis of the body. This is the one situation where your fear of the walker and wheelchair, and doing nothing about, will provide you the paralysis you need to end up with the walker and wheelchair…you will get what we fear. Why not try, “okay,” and then do something to provide a solution to the problem. Accepting your Parkinson’s and your Parkinson’s body, with all of your newly discovered physical limitations and pains, is part of the process of recovery. After Sally said let’s put a plan together, I read the book, What your doctor may NOT tell you about Parkinson’s Disease, by Dr. Jill Marjama-Lyons. It covered the medication and alternative approaches to dealing with the disease. The thing is, I did not want to “deal” with the disease and I did not want to “maintain” the best possible life with the disease. Simply put, I did not want to have the disease, which is something I had been told was impossible. However, recovering from Parkinson’s without medications was the only alternative for me. Faced with what I felt was the only alternative for me, I got on the path toward recovery and I never got off. From what I had learned in Dr. Marjama-Lyons’ book, it seemed to me that Parkinson’s sufferers had been medicated for such a long time that experiencing the disease from a non-medicated body would be the way for me to best understand what was going on. I decided that if I experienced Parkinson’s as it was with no medications and no supplements and no pain killers, then I would understand Parkinson’s as it was…raw and unaltered…from inside a Parkinson’s body, and that would provide me the best opportunity to solve it and recover. As it worked out, it was a good thing that I saw this as my only alternative because it was not easy. It forced me to accept things far worse than I ever anticipated I would have to accept…”I am curled up on the floor in excruciating pain, ‘okay.’ What is my solution?” I then would meditate and pray to bring my mind and spirit to a more peaceful place while my body endured the pain of recovery. So, you have Parkinson’s…”okay!” What are you going to do about it, right here, right now? Why not say, “okay,” get on your path to recovery doing the soul, mind, and body parts of the Parkinson’s Recipe for Recovery®, and stay on your path to recovery until you fully recover. You are so much more than your Parkinson’s symptoms! Do not live your Parkinson’s symptoms. Nothing good comes from that. Live your life. Do not just be alive, but actually live your life and find joy in your heart. Find compassion and happiness and love and peace and contentment in your heart. Find forgiveness in your heart…for others…and for yourself. You did not do anything wrong to get Parkinson’s, so forgive yourself! That’s right, open your heart and find the forgiveness you need to realize that Parkinson’s is providing you the opportunity to heal yourself — your soul and your mind and your body. Seize the opportunity. Do the Recipe and seize the opportunity to recover! So, you have Parkinson’s…okay! What are you going to do about it, right here, right now? Why not say, “okay,” get on your path to recovery with the Recipe, and stay on your path to recovery until you fully recover. Okay? Yes! Okay, okay, okay!!! This entry was posted in Fighting Parkinson's Drug Free. Bookmark the permalink. Thank you for another wonderful nugget of wisdom and encouragement Howard, reality is not fun at times, but armed with a plan changes it to a positive outlook ! I thank you for the wise and thoughtful post!! I am self diagnosed but have been on the journey for 1 1/2 years. Earlier this winter I did a search trying to see if there was anyone who had recovered and your page came up. It gave me hope and I did additional research. Now I am convinced that I will recover, it will be a struggle. You have helped me with vision and hope. Thank you!!! Thank you for not giving up on us even when we feel like giving up on ourselves! Thanks again for your steady support we need so much. help not to give up in days where the things aren’t working well. Thank you for this great post. I read it out loud to emphasize every word. You chose to recover without taking any kind of medication. That’s incredibly brave. Has anyone experienced healing while taking medication? I experience the raw nature of Parkinson’s every day cause I only take very little medicine and on some days none at all. But I still don’t have the courage to quit alltogether. Hi All. Thank you for your wonderful comments. Christiane, in answer to your question, Pratima seemed to exhibit no symptoms prior to getting off of all of her medication. However, until such time as she finished getting off of her medication, we would not know if the medication was hiding any symptoms. Six days after eliminating her medication, she still showed no symptoms, and we announced her full recovery. Her recovery was medically verified by her neurologist the follow month. Here are the details, https://www.fightingparkinsonsdrugfree.com/2012/05/22/fighting-parkinsons-and-pratima-is-symptom-free-from-stage-4-parkinsons/. Love all this! Thank you Howard for encouraging thoughts and amazing coaching and thank you all for great comments for the journey. Thank you Howard, It is tremendous to be reminded of OK!!!!! Very hard to do when in pain but you inspire me!! Today I note that Howard often asks me how I’m doing? Thinking of my left arm tremor and heavier than normal gait, I generally give a flat reply like, “Oh, about the same as usual.” The reality is today l feel pretty darn good. Maybe not perfect, but PRETTY DARN GOOD! So I’m going to relax, focus on how good I feel, rejoice and see what that does to the old PD. Thanks to Howard and everyone. Like prior to PD at night in bed things seem impossible,but in the morning they are more manageable. Trusting and having faith that it’s Ok helps immensely. Thank you Howard for your blogs. It keeps us motivating. And this one with an okay has changed our mindset completely. Shrinivas has never taken medications. He is 48 yrs and was diagnosed 3 years back. But today he is at his best and getting better. And trust me, his will power to get better and the belief and faith that soon he will take one day at a time as it comes and have faith in the recovery receipie has helped him reach where he is today. Thank you Howard for touching our lives. Howard, I liked this blog. It’s very true. I have to do this. Thanks for the great blog. They always make me think. I can do it. I read all the recovery testimonies, especially Betty from July. If they did we all can do it. Great belonging to this blog. 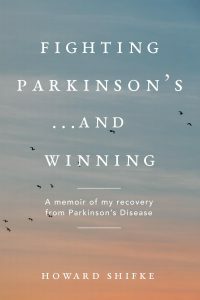 Fighting Parkinson’s…and Winning, Howard’s new book. Click the image for information and purchasing options.